With a 72-hour truce apparently holding and Israel also apparently having ended its ground operation in Gaza, it seems a fair time to assess where things stand now. Has anyone emerged from this in a better position than it was in before? Is there anything that can, at least in a cynical and Machiavellian sense be called a victory? 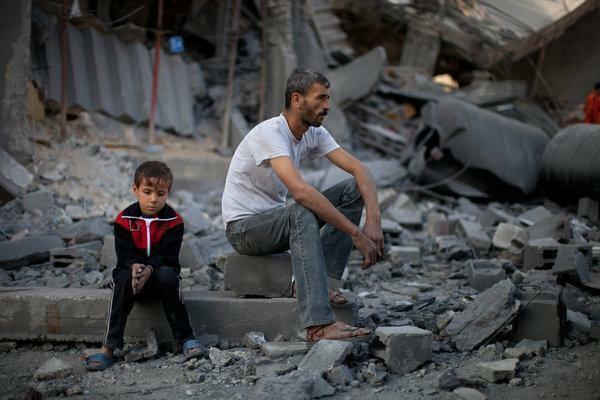 It goes without saying that the overwhelming majority of the physical destruction was borne by the people of Gaza. At this point, the numbers are just horrifyingly grim. 1,968 dead, of whom 1,626 were civilians. 7,920 wounded, and while there is not a precise percentage of civilians among the wounded, we do know there were 2,111 children and 1,415 women among them. Like many of us, I’ve been very busy on social media since this started. I see a lot of ignorant nonsense there, and it’s not limited to the pro-Israel side. I also see a lot of shoddy thinking and ignorance of the facts. Since I had to study up on a lot of this for my job as the Director of the US Office of B’Tselem, I thought I might clear a few of those up. Various memes make the rounds in discussions of war crimes. One that I found particularly laughable was “Even the UN says Hamas is committing war crimes but they say Israel only might be.” I’ve also seen defenses of Hamas’ firing of missiles at civilian targets at Israel based on Palestinians’ right of self-defense. Another piece of mine on Obama’s Mideast trip. This one, at LobeLog, digs down a bit deeper in the events and speeches to explain why I think this is just a part of the broader process of the US stepping away from the Middle East in general. In my latest piece for Souciant, I speculate about the possibility that the strong performance of Israel’s Iron Dome missile defense system in recent days might make Israel even more reckless and foolhardy about an attack on Iran. I still don’t believe an attack on Iran will happen, and make no mistake, I am delighted that Iron Dome can protect innocent Israelis from harm (it would be nice if Palestinians had any sort of protection at all, let alone something similar). Still, with the heightened rhetoric and tough talk, and the moves to increase pressure on Iran, we have an atmosphere where a mistake or miscalculation could bring on results I don’t think anyone, save for a few warmongering neoconservatives, really wants. A lowered sense of vulnerability can, possibly, make that risk worse.